If body 2 is black, , and . Therefore, again, for any gray surface (Kirchhoff's Law). for silvered walls. ; . For the same , if we had cork insulation with , what thickness would be needed? so a thickness would be needed! The thermos is indeed a good insulator. Figure 19.7: Thermocouple used to measure temperature. Note: The measured voltage is related to the difference between and (the latter is a known temperature). Thermocouples (see Figure 19.7) are commonly used to measure temperature. There can be errors due to heat transfer by radiation. 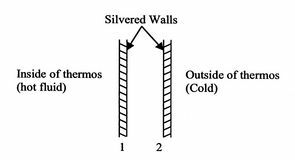 Consider a black thermocouple in a chamber with black walls. 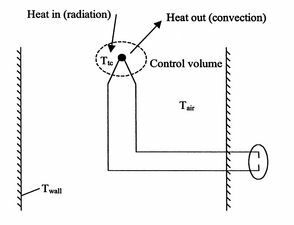 Suppose the air is at , the walls are at , and the convective heat transfer coefficient is . What temperature does the thermocouple read? from which we find . The thermocouple thus sees a higher temperature than the air. 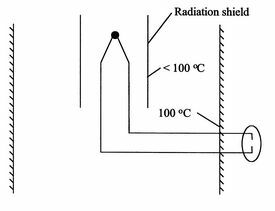 We could reduce this error by shielding the thermocouple as shown in Figure 19.9.